Catherine is one of five CVN Serving with Sisters Ambassadors – volunteers sharing the joy, energy, and fulfillment of serving alongside Catholic Sisters in CVN member programs, through creative reflection, conversation, and experience. Enjoy this post, and stay tuned to hear more from Catherine and her fellow Ambassadors over the course of their service year! 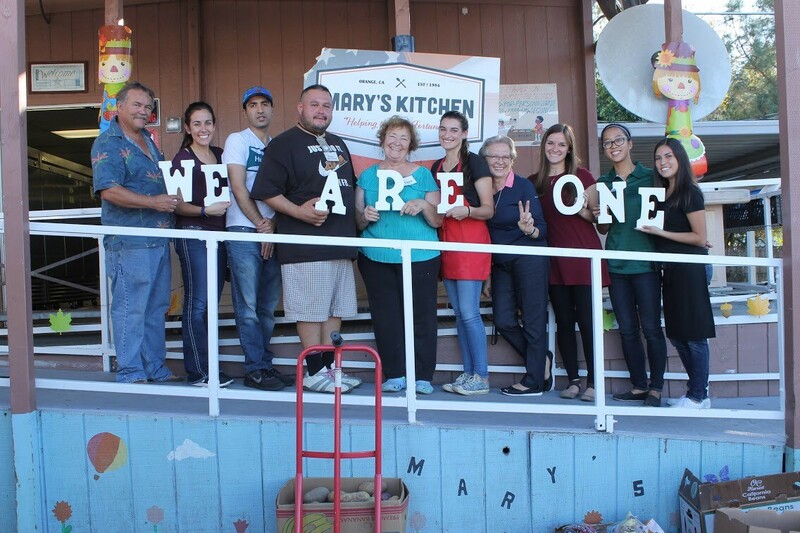 Here is the SJW program, along with a few volunteers who serve alongside Katie (one of my fellow St. Joseph workers) at Mary’s Kitchen, a local soup kitchen that serves a great number of people in the community. We had an opportunity to serve together the day after Thanksgiving. I think this photo captures the essence of how the Sisters of St. Joseph collaborate with others to care for our dear neighbor, uniting us all together. In the months leading up to the start of my service year as a St. Joseph Worker, I could never imagine the many graces God had in store for me. The St. Joseph Worker Program (SJWP) has cultivated my awareness of God’s Presence in my daily experiences, those I encounter at my service site, within my community, and especially within myself. Coming to appreciate the gifts and talents that God has entrusted to me, the SJWP has given me a chance to channel these gifts and talents to the greater purpose of serving God and my dear neighbor. The SJWP has empowered me to see past my own needs, and to be open to the needs of others in our local community here in Santa Ana, CA. Awareness presents invitations. Being aware of the growth in poverty and homelessness in this area, or even the presence of domestic abuse and drug use within my students’ families, I experience God’s invitation to be His extended Body – to see with His loving eyes, to touch with His healing hands, to walk into unknown territory with His swift feet, and to simply love…to love as He loves. I am no savior; I learned that during a mission trip to Vietnam three years ago. Thus, I have, and am still, learning to embrace my limitations as a human being. I can only cultivate and use the gifts that God has given me to fulfill the unique mission that He invites me to. This may mean being with and listening to a student who is crying or upset. Other times, it may mean a simple hug and prayer for a person who does not have a home. A “good morning” and cup of coffee, combined with a smile and eye contact, may be enough for another a person to experience God’s Loving Presence. Doing all that is within the power God gives me, I can rest knowing He will bring works to fruition according to His own goodness and providence. I am simply His instrument, and He is the grand Musician. The human family is just that, a family. We are all beloved children of God. Though easy to say and compose into words, this truth is often overlooked in the midst of division or sense of individualism. I am indeed my brothers’ and sisters’ keeper. Yet, I have often experienced the inclination to prioritize myself over others. In the midst of the typical business of a service year, I sometimes find myself exhausted from exerting so much energy towards being with and for others. After spending seven hours with my students, all I want to do when I go home is take a nice nap or relax with some Netflix. As such, there may be a lack of motivation to go to events that may be available for enrichment or learning more about social justice needs. In the same way, there are times when I am more concerned with taking care of myself, that I may miss opportunities to be present to my fellow SJWs and their needs, either spoken or unspoken. Time and time again though, the SJWP’s charism, as well as that of the Sisters of St. Joseph, invites me to be more mindful of my experiences and those I am with. It may just be that in the uncomfortable and inconvenient moments I am called to grow in a deeper love and solidarity with others. Moments as such call for my willingness to live this service year fully, to be present and mindful of the needs around me, and to respond accordingly. While moderation and balance are essential to holistic growth, the Gospel presents an invitation to us all: “You shall love the Lord, your God, with all your heart, with all your being, with all your strength, and with all your mind, and your neighbor as yourself” (Luke 10:27). Imitating Christ Crucified, we are all called to give our very lives, to die to ourselves and our inordinate desires. This spiritual and internal sacrifice looks different for each person. I find that it is often easier for me to give of my material and external possessions. Still, gently and patiently, Christ calls me to give the greatest gift He gave me – my life. It is in this giving, or rather, returning, that I have been able to receive the fullness of life of the Risen Christ. The term vocation derives from the Latin “vocare,” to call. Vocation is not about doing. In fact, it has little to do with ministry. Vocation is essentially the call to be. It is the core identity of who one is, of who God creates us to be in every moment. It is so easy for me to get carried away with the habitual movements of each day, be it at home with my community or at my service site with my students. Losing sight of service, my ministry becomes more of a job that I am required to fulfill. Burn-out and stress soon follow, which have been indicators of my need to re-center myself on the charism of the SJWP and the purpose of my presence in the SJWP. Reminded that the work I do using the gifts I have, is not authored by me, but by God alone, I try not to be so focused on doing the work – God’s work. Rather, entrusting all I do to God’s providence, I am grounded in Him and what He asks of me in each moment. Furthering my discernment of God’s vocation for me, the SJWP and the Sisters of St. Joseph have helped me to deepen my relationship with God and prayer through the ministry of unifying reconciliation. My ministry, education, can only be fruitful if I allow it to be guided by God’s Spirit and if it is done for the greater glory of God. Likewise, my prayer life cannot be merely the spewing of word after word. Prayer is being aware of God’s Presence and simply being with Him, even if it is in silence. It all goes back to the simple call to be in relationship with God. Without this foundational relationship, lived through a life of prayer, I am unable to discern, to ask and listen to God’s will for me. My ministry and all that I do should be reflections of my relationship with God. As one of the core values of the SJWP is spirituality, I have been presented with many opportunities to go on retreats, have weekly communal “Sharing of the Heart,” and learn about different aspects of spirituality and prayer. In Orange, CA, the SJWP has also been graced with a beautiful campus where I find refreshing moments to simply sit in nature and be with God. It is in the stillness that I renew not only my energy, but also my desire to respond to what God calls me to in my day-to-day service.